An actor flew in from Hollywood to guest edit the regional daily he used to deliver as a paper boy. 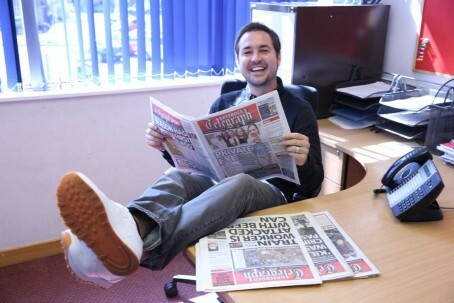 Martin Compston, who is known for his role as Detective Sergeant Steve Arnott in BBC series Line of Duty, took on the task at the Greenock Telegraph for a day. Greenock native Martin was back in the United Kingdom from his current home in Los Angeles to attend the National Television Awards, and was invited by Telegraph editor Brian Hossack to spend a day in the office on Wednesday. As well as proofing copy and helping with the edition’s design, Martin also took time to catch up with some of the goings-on in his home town by checking out some back issues. Said Brian: “I’ve worked with Martin on a few things for our local hospice, of which he is a patron and committed fundraiser, and I know how well-loved and admired he is locally and across Britain now through his work. “With that in mind I thought it would be great to ask him to take charge, after all, who doesn’t fancy a day off – especially when you have one of Britain’s most popular actors waiting in the wings.